El Mahalla El Kubra (Egyptian Arabic: المحلة الكبرى‎, Egyptian Arabic: [elmæˈħællæ lˈkobɾɑ], Coptic: ϯϣⲁⲓⲣⲓ Dishairi) – commonly shortened to El Maḥalla – is the largest city of the Gharbia Governorate and in the Nile Delta, with a population of 535,278 as of 2012. 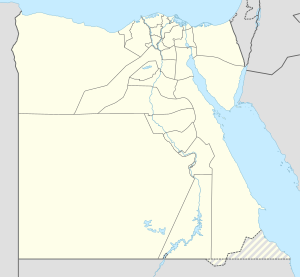 It is a large industrial and agricultural city in Egypt, located in the middle of the Nile Delta on the western bank of the Damietta Branch tributary. The city is known for its textile industry, and hosts the Misr Spinning and Weaving Company which employs c. 27,000 people. El Mahalla El Kubra consists of two words: El Mahalla in Arabic means "encampment", El Kubra means "great". Hence the title collectively means "The Great Encampment". El Mahalla El Kubra was known as "Didouseya" (which might refer to Hibiscus cannabinus) during the Roman era, meanwhile it was known as "ϯϣⲁⲓⲣⲓ" in Coptic records. El Mahalla El Kubra was designated as the capital of Gharbia Governorate in 1320 by Ibn Qalawun, before it was relocated to Tanta in 1836. Over 15,000 protesters clashed with police in El Mahalla in 2006, following the publication of a cartoon mocking Islam in Denmark. Later in 2006 textile workers struck to protest market reforms, demanding better living conditions. Beginning in April 2008 the city held mass demonstrations protesting the election results of President Hosni Mubarak, claiming election fraud and demanding better wages. Security forces were ordered to crack down on the dissidents, and in May they killed two or three in the city and injured dozens. Images of protesters in Mahalla overturning billboards of Mubarak were viewed by some Egyptians as a turning point in Egyptian politics, according to The Washington Post. The Observer has written that protests in El Mahalla from 2006 to 2011 spearheaded larger political changes throughout Egypt. A Facebook group established by 28-year-old engineer Ahmad Maher to support striking textile workers in El Mahalla gained 70,000 followers and helped organize support for the strikers nationally. In 2011, protests in Mahalla contributed to the collapse of the Mubarak dictatorship. On 15 July 2012, 25,000 workers from El Mahalla El Kubra's Misr Spinning and Weaving Company went on strike, demanding increased profit sharing, better retirement benefits and a replacement of the management. The Misr workers were joined by workers from seven other textile factories in the region, and strikes also broke out among doctors and health workers, university workers, and ceramics workers in other parts of Egypt. Clashes between protesters supporting or opposing the Muslim Brotherhood on November 28 left over 100 people injured. On December 7, the city declared itself autonomous from Egypt, as workers and students, declaring themselves independent from the "Muslim Brotherhood State", cut rail lines and blocked entrances to the city. Protesters stormed the city council and announced their intentions to replace it with a revolutionary council. The Köppen–Geiger climate classification system classifies its climate as hot desert (BWh). El Mahalla El kobra contains Misr Spinning and Weaving Company,the largest cotton manufacturing company in Egypt, and the clock of Big Ben is made by this company. El Mahalla El Kubra is home to the largest public sector Egyptian textile company, the Misr Spinning and Weaving Company, employing over 27,000 workers. The city has two football teams: Ghazl Al-Mehalla and Baladeyet Al-Mahalla. ^ "Al-Maḥallah al-Kubrā". Encyclopædia Britannica. ^ "المحلة الكبرى". nfa-eg.org (in Arabic). ^ Bilesfky, Dan (11 February 2006). "Danish Cartoon Editor on Indefinite Leave". The New York Times. ^ a b c d Stern, Johannes (8 December 2012). "Protests spread throughout Egypt against Islamist dictatorship". World Socialist Web Site. Retrieved 8 December 2012. ^ a b Knickmeyer, Ellen (18 May 2008). "Fledgling Rebellion on Facebook Is Struck Down by Force in Egypt". Washington Post. ^ a b Shenker, Jack (23 January 2011). "Egypt's frustrated young wait for their lives to begin, and dream of revolution". The Observer (England). ^ Verma, Sonia (27 January 2011). "How Egypt got here: A brutal beating and a penchant for Facebook has protesters eager to brave the streets". The Globe and Mail. ^ a b Stern, Johannes (18 July 2012). "Egyptian workers mount mass strikes against US-backed junta". World Socialist Web Site. Retrieved 8 December 2012. ^ "Clashes Spread Beyond Cairo". Washington Post. 28 November 2012. Retrieved 8 December 2012. ^ Bakr, Sara (7 December 2012). "Mahalla announces autonomy". Daily News Egypt. Retrieved 8 December 2012. ^ "Climate: Mahalla al Kubra - Climate graph, Temperature graph, Climate table". climate-data.org. Retrieved 13 August 2013. This page was last edited on 29 March 2019, at 22:34 (UTC).